Whenever powders are in movement they will pick up an electric charge. Find out what happens when trucks try to load tribocharged polymer granules at 30,000 lbm/hr into an ungrounded storage silo. 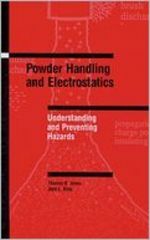 This book is a must for anyone involved in large scale powder handling who wants to avoid explosions. Written by two leading experts in the field with over fifty years of combined experience. Charge generation; separation; dissipation; electrostatic discharge. Ignition; particle size; dissipation; level indicators; pneumatic transport; corona degradation; conductive fibers in filter bags and liners. Mt. Vernon; Union Carbide; United Biscuits; propagating brush discharge; powder and liquids. Abatement of electrostatic hazards in dusts.